LESSON VI - THE HANDWRITING ON THE WALL. - Daniel 5:1-31. Lessons From the Book of Daniel LESSON VI – THE HANDWRITING ON THE WALL. – Daniel 5:1-31. LESSON VI – THE HANDWRITING ON THE WALL. – Daniel 5:1-31. 1. 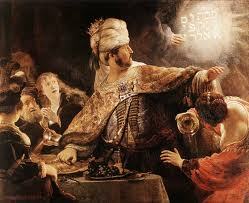 WHAT did Belshazzar the king do? Verse 1. 2. “What did he command? Verse 2. 3. What was done with these vessels? Verse 3. 4. To whom did they give praise? Verse 4. 5. “What happened the same hour? Verse 5. 6. How did this affect the king? Verse 6. 7. What order did he give? Verse 7. 8. What reward did he offer? 9. When they failed to read the writing, how did the king feel? Verse 9. 10. With what words did the queen comfort him? Verses 10-12. 11. When Daniel was brought before the king, what did the king say to him? Verses 13-16. 12. What reply did Daniel make? Verse 17. 13. What did Daniel relate concerning Nebuchadnezzar? Verses 18-21. 15. What did he say was written on the wall? Verse 25. 17. What command did the king give? Verse 29. 18. What proclamation did the king issue? Verse 29. 19. What was his fate? – Verse 30. 20. Who took the kingdom from him? Verse 31. 1. The Lord’s prophets and His true servants have never feared to administer reproof even to kings. ‘ The cases of Nathan, Jeremiah, John the Baptist, and many others, might be cited. They will always be very careful, however, to speak the word of the Lord, and that only, lest they do more harm than good. Those who love to give reproof are almost sure to do it in their own spirit, and not in the spirit of Christ. Those who are kind and merciful in spirit do not enjoy giving reproof. It pains them to do such work. They will be sure to seek the Lord that they may reprove wisely and in the spirit of the Master. 2. THESE words were from the Hebrew language, which was not understood in the king’s court. The words and their definitions are as follows: Mene, numbered; tekel, weight; peres, divided (peres is singular, “and upharsin is the plural). It will be seen that it was not sufficient to simply know the meaning of .these words. It needed the wisdom of God to know to what He would have them applied, and Daniel, the prophet of God, had wisdom imparted to him so he could apply them correctly, as the sequel clearly proved.